Speaking in other languages is harder than it looks at first. You can read books and study flashcards, and still choke when you speak to a real person. It can be difficult to practice pronunciation and have conversations on a regular basis. Tutors are awesome, but your lesson time is limited. And many apps and bots make us feel detached. Speechling claims to have cracked that problem. This new app offers speaking skill training, attractive design, and the most convenient access to a real person tutor that I have ever seen. No scheduling, no exchange of Skype names. Sounds good, but does it work? In this review, let's take a deep dive and find out. Speechling's courses use sentence repetition, a premise that you may know from fellow Fluent favourite Glossika. But there is a twist: Speechling includes feedback on everything you record, from an actual human. After repeating the sentence you see and hear on the screen, you have the choice of listening back to your pronunciation, or to save it for coaching. After you save your recording, you will receive feedback and tips from a Speechling coach. In French, my language level is around B2-C1 on the CEFR. I can navigate most conversations without hiccups, and I know for a fact that speaking French is what I need the most. So for my level, saying a few sentences every day at my own convenience was perfect. The live feedback here was eye-opening. I have an optimistic blind spot to my own weaknesses in pronunciation and word choice. I always learnt French in academic environments, so I produce great grammar. But in reality, my spoken French sounds textbook and a little uncomfortable. The coach feedback made me more aware of my little mistakes without discouraging me completely. I felt encouraged to try again, to fix what I was saying and carry on. With the freestyle mode, I got to practice free speech instead of repeating pre-written sentences. In the dictation feature, I added listening comprehension at natural speeds. if my pronunciation is accurate. The module I chose was “Beginner (A1)”, which was a great entry point after a few years off. With each repetition, I felt like I was learning. The examples were well pronounced, came at a speed that felt like a suitable challenge, and soon I was improving. I also felt that pronouncing each new word immediately helped me remember it, especially when I added a recording. The accountability of recording and coaching (“someone will actually hear this”) helped me link the phrase with a strong emotion. For more about how emotions amplify memory, check out my interview with Gabriel Wyner from Fluent Forever. With a language like Russian, you need regular exposure to stay comfortable with the alphabet and pronunciation. Speechling surprised me here because it felt like the perfect tool. There were so many sentences I had never said before, and so many opportunities for me to improve. Best of all, I was speaking Russian right there and then without any hesitation. Of course, exposure to lots of sentences won't teach me more than lots of sentences. If I wanted to get back into Russian and start making steady progress, I would definitely use Speechling and I would add a textbook, dictionary, grammar explanations, and lots of input resources. Chinese is the only language out of Speechling’s range that I have never studied, so I decided to go for the “simplified” version. Does that mean easy Chinese? No idea, but it's worth a try. The module I chose was “Beginner (A1)”, as there was no way of picking anything even easier. With Chinese, Speechling shows the sentences in Hanzi (Chinese characters). There is also the option of viewing the sentence in pinyin. Good job - it was the only way I could even start to guess at repeating the sounds I was hearing. For a complete beginner like me, the sentences were interesting. I had to repeat the audio input 4-5 times before I dared to repeat the sounds. Surely, any Chinese speaker would be impressed? Well, I do know a Chinese speaker so I was ready to shine. Having newly acquired the sentence 今天很温暖 (“it’s warm today”), I asked my co-working buddy to listen to my Chinese and tell me if it’s correct. And he did understand what I was saying, although “impressed” would be stretching the truth a bit. I also sent my recorded sentence to the Chinese coach, who drew my attention to the specific parts I got wrong. Learning mass sentences as a complete beginner isn’t ideal. It leaves you without a sense of what each word means (which one out of jin tian hen nuan huo is “warm”, which one is “today”....and what do any of those symbols mean?). Learners don't get to understand what any of the rules of speaking are. But that’s okay, as Speechling not designed for that. This tool is a great confidence builder and accent sharpener. I could imagine it as a fantastic basis for tutoring, sending students away with homework on a topic. If you have studied more than one of Speechling’s range of languages, you can view translations in any of the six languages. This means you get to practice two languages at once, and it’s one of easiest ways to train your polyglot muscles. On several occasions, my recordings were too long to be saved for feedback. This is understandable, but it was frustrating particularly in the freestyle mode. It’s disappointing when you say a complex sentence to send to your coach, and then get a message saying “file too large - cannot save”. It would be great if Speechling could include a guide on how long I can record for. For languages where I knew nothing at all, I’d also like to see a primer module so I understand what I'm doing. But this is a tiny point, especially since Speechling is not aimed at complete beginners. All in all, I found Speechling a great addition to my studies. It was challenging and helped me improve my pronunciation and speaking skills in three languages. I was most excited about what Speechling could do for my Russian language skills. I improved both my vocabulary and accent, and the process was efficient and fast. Speechling is free from robot voices and works with male and female voices (native speakers, of course). Its interface looks great and it gets you into the action immediately. I love the record-feedback cycle, because it prompts you to re-record a better version of what you said. You get feedback, and you improve pronunciation, confidence, and speed. The coaches were great for all the languages I tried. They recorded speedy corrections. At the very early levels, feedback is not rich, because they are native speakers and they use their native languages. But even so, it was clear where exactly I was supposed to change something. The more you learn, the more you will get out of these coaches. If you work with a tutor that you don’t see every day, definitely try adding Speechling to your language routine. You will be speaking your target language more, you'll build a better accent. And best of all, pronouncing all the new words will help you remember them faster. Create a free account and start speaking at Speechling.com, or by download the app from the App Store or Google Play Store. Speechling is currently available in six languages: French, German, Spanish, English, Russian, and two types of Chinese. keep track of your progress with the audio journal. The unlimited plan is open to Fluent readers at a 10% Lifetime discount: Make sure you use the code FLUENT when you sign up. Good to know: Speechling is a non-profit company and also has a classroom version called Speechling for Education. I have an existing relationship with Speechling as they are a sponsor of my podcast. This only influenced the amount of attention the product received, not the verdict. It is a cool app. Are you a pronunciation master now? How did you like the coach feedback? Leave a comment below and share your story. Since my original review of Speechling in February 2018, these folks have been hard at work and have just emailed me to share the following new developments. 1. A new module called "Speechling Foundations", which will teach newbies from the very beginning. This start from zero module covers teaches the most essential words in context. 2. 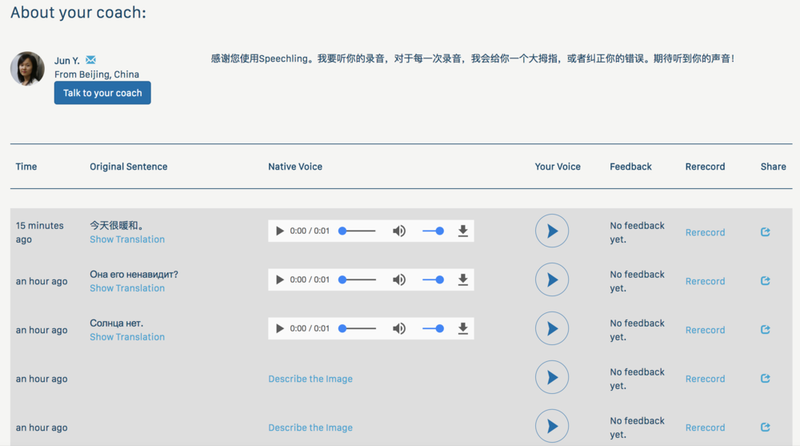 New listening options: Speechling now offers listening comprehension, multiple choice, fill in the blank, and flashcards. It's all available for free without login. All of this works on mobile too. 3. More language! They've more than tripled our content collection. 4. Offline mode!! Premium users can download a huge chunk of Speechling’s sentence collection (~10k sentences) and even audio books and Anki decks . I love it when an app listens to its users, this alone makes it worth checking out! Click here to try Speechling for free, as long as you want.